Hometown Holidays Tree Lighting: 5PM – The Junction presents our 6th Annual Tree Lighting Event. Join us for music, entertainment, revelry, prizes, and much more. It’s community event for the family, friends and neighbors. First of three raffle drawings and everyone enters to win tickets to Stevens Pass Ski Resort. Where: Farmers Marking Parking Lot at 44th and Alaska Ave SW. Hometown Holidays Headquarters: 12-4PM – Stay local on Sundays and enjoy what your neighborhood has to offer. Meet us in front of Key Bank for festivities and information on shopping, the $6500 raffle, and in-store events. Santa Photos: 12-4PM Santa Photos – Santa will be here to listen to your children’s Christmas requests. 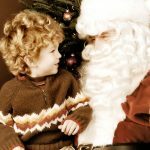 Professional Santa Photos by Donna Ryan Photography and a suggested donation of $10 or more will be donated to our West Seattle charities. Also help make ornaments for the holiday tree. Santa donations to West Seattle Food Bank, West Seattle Helpline and West Side Baby. Free Gift Wrap: 12-4PM – Receive a complimentary holiday gift wrapping by Swee Swee Paperie with any $50 or more purchase from participating West Seattle Junction merchants. Additional holiday gift wrapping services are available for a fee with a portion of the profits to be donated to a local charity. 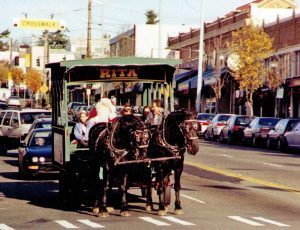 Mule Carriage Rides 12-4PM – Take a traditional carriage ride down California pulled by beautiful Belgium Draft Mules. This is a treat to enjoy with the whole family and friends. Carriages depart on California in front of Key Bank. West Seattle Art Walk: 6-9PM – Meet us in The Junction for a night out on the town. Check out the local art, enjoy drinks and snacks, and cross items off your holiday shopping list. Get in the holiday spirit with this lively evening event.